Health Benefits Of Pomegranates & How They Can Change Your Life! Pomegranates are a delicious fruit that can satisfy a craving at any time of day. But did you know that this tasty snack is also filled with nutritious goodness? There are so many wonderful health benefits of pomegranates! This food is actually considered a power food. Not only are pomegranates filled with disease-fighting goodness, but they’re also filled with Vitamin C. Fresh juice from one pomegranate supplies you with 40% of your daily recommended intake! Plus, they’re rich in Vitamin E, potassium, Vitamin K, and folate, fiber, and iron. Did you know? Pomegranates improve digestion and reduce inflammation found in the gut. The peel, leaves, and bark of pomegranates have been used to help calm stomach disorders and tea made from the leaves of this fruit helps to cure digestive problems. Isn’t that awesome? A study shows that drinking 8 ounces of fresh pomegranate juice each day improves memory and learning. There are many people I know who complain about suffering from memory loss. Who knew something so tasty could help jog memories? Another wonderful health benefit of pomegranates is that it protects against a bunch of oral diseases. Therefore, eating pomegranates is a great way to keep a healthy smile. Also, these fruits heal the damage caused by hardening and thickening of the arterial walls. Also, pomegranates help prevent the oxidization of LDL (bad) cholesterol. Because of this, blood flow remains healthy and the risk of stroke and heart attack remains significantly low. Since heart disease is the number one killer in America, it may be smart to add some pomegranates to your shopping list next time you’re out in town. Since these iron-rich fruits help combat against anemia. Therefore, by getting enough iron you reduce the awful anemia symptoms such as weakness, hearing loss, dizziness, and exhaustion. The number one cancer for men in the United States is prostate cancer. However, pomegranate juice has blocked the growth of prostate cancer cells in one study. Woohoo! 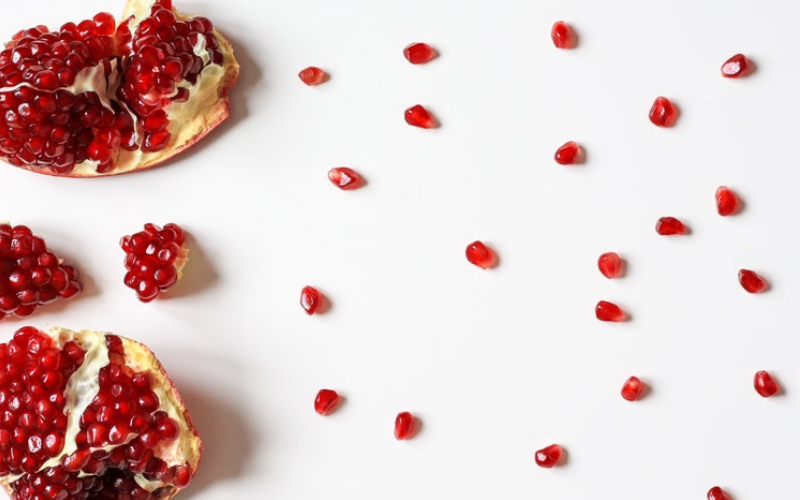 Were you surprised by any of these cool health benefits of pomegranates? What surprised you the most? Next time your grocery shopping, don’t forget this tasty, nutritious snack!